What could you achieve in your career, home, academics or in competition if you learned to be Mentally Tough? Having an excellent work ethic is extremely important, but it is not enough when it comes to performing your best, especially in high-pressure situations. Developing Mental Toughness is a vital piece of the puzzle. It’s exciting to learn how to think like an elite athlete so you can achieve your very best ... and there are 7 steps to becoming Mentally Tough. There will be times, for example, when you don’t get all the information you need for a meeting, when you are overlooked for a promotion, or when you don’t get onto a project team you feel you deserved to make. However, worrying about change, or dwelling on the idea that “it is not fair” will not lead to progress or your desired result. You will need to have Zero Excuses and figure out how to learn from these situations in order to improve. It is okay to be upset briefly. But in order to keep moving forward, you need to be resilient and figure out solutions to get the results you want. You need to have Zero Excuses. Your colleagues or friends can be your allies, but it is up to you to take action for your success. An important part of having Zero Excuses is attitude. How will you show up every day? Having Zero Excuses will help you make consistent and measurable progress. It involves you learning to be accountable. In order to get to where you want to go, you need to have a plan. Think of it this way: What if you got in your car and wanted to drive across the country as directly and economically as possible without a map, phone, or GPS? You would likely make it, but it would probably take longer than expected, cost more than budgeted, and you may likely run into some logistical problems. Taking time to map out your journey can be incredibly helpful to give you direction, motivation, and keep you on course to make progress. Normally, you start something new at the beginning. We’re going to flip this and start with the end in mind. Many times, elite athletes have a Long-Term Objective that almost seems like a dream be-cause it is so far off in the future, and because it’s so lofty. This dream is the beginning of a planning process for achieving what is important to you. If you understand what this objective is and how it functions, you’ll have the beginning blueprint for your success. Have you ever lost focus during a competition, a project or an important presentation? What would happen if an elite athlete lost focus at a critical point in the race? Your endeavors are no less important to you, and it is vital that you have Noteworthy Focus during moments that matter. Performing at the level of an elite athlete is not likely for most of us, of course, but you can achieve that level of focus. Noteworthy Focus means having a plan for your performance and being able to execute it. What do I have control over that will help me do my best? Re-adjust as needed. What will I do if I become distracted, nervous, or worried? Breathe in for 4 counts, then breathe out for 4 counts. What matters most for my performance? Think of one or two things you have control over to do the best you can in the moment. That’s it. You should put your energy towards taking control over what’s most important and become very deliberate about it. Everyone, including elite athletes, CEOs, surgeons, famous musicians, and top students, likely feel negative emotions from time to time. If this is the case, how can they perform at such a high level, consistently? They know how to manage, not get rid of, their emotions. They understand when negative emotions are and are not appropriate to deal with, and they have the tools to make the necessary adjustments. Dialogue (or “self-talk”) puts you well on your way to thinking like an elite athlete, so you can perform like a champion! Dialogue is your internal voice that can make you feel invincible, helpless, or somewhere in between. Keep in mind, we tend to believe what we consistently tell ourselves. This can be very useful or detrimental. Your Dialogue can be influenced by family, friends, peers, coaches and others in your circle. In order to perform to the best of your ability, it is important that your Dialogue remain positive and encouraging, rather than negative and judgmental. Feeling anger, disappointment, or frustration is completely understandable, but how you process these thoughts can affect your future performance. There are only so many hours in the day that you can practice for an important event. Do you ever wonder if there is a way to improve in addition to physical practice? How do some elite athletes who are injured, unable to train or who simply want to have an edge maintain their level of competency or get better? Imagery Training is an advanced tool to do just that. You can learn how to do it too! With Imagery Training, you use your mind to trigger muscle memory and to simulate a situation. This leaves you better prepared once you are in the moment. Imagery Training needs to be very vivid. In other words, the more senses you include, such as sound, touch, sight, and even smell, the more effective it can be. Imagery Training is made up of the most important sequences of your activity. Sequences are specific events that are important to what you are trying to accomplish. For example, a free-throw sequence for a basketball player would start at bending her knees and end with the follow through. The more you can be very aware when you do a sequence correctly, the more proficient you will be when it comes to practicing it during your Imagery Training. It has been proven that physical practice and Imagery Training together can help with performance more so than physical practice alone. Errors are inevitable and how you handle them can play a big part in you being your best, especially in moments that matter. Have you ever experienced a downward spiral, when it is difficult to get back on track after a few errors? That’s a case of past performances affecting future results. Neutralizing Errors can help make sure this does not happen to you. By now, you should realize that errors happen at all levels, so hopefully you are becoming a little more at peace with them. The trick is to look at errors differently. Errors can be a phenomenal learning opportunity. Understand that errors will happen, they do not define you, and they only have as much power as you give them. Think of an error as a person you are not particularly fond of who you run into the lunch room or in a social situation. He really wants to talk to you, but you really would prefer not to. Smile, tell him you are really sorry, but you’re in a big hurry. After you get past him, you think “he is a nice person, but he always talks about himself and doesn’t care about what I have to say.” You vow to listen to others more when having conversations. Get the idea? Be at peace with errors, and think about what adjustments you can make to recover or to get better in the future. 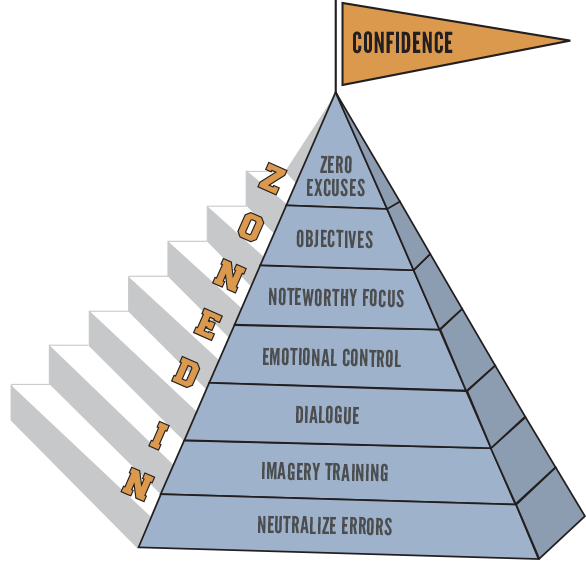 Confidence is the culmination of all the other stages of the “ZONED-IN™” Mental Toughness framework. Confidence is the belief in your ability, not your expectation that you will win or be the best. It is your belief that you are prepared and capable. Confidence is often thought of as the “single most important mental factor in sports” (Dr. Jim Taylor, The Huffington Post, 2/24/11, "Confidence Matters for Athletes"). It is difficult, if not impossible, to focus well on your task if you are not confident. Keep in mind that confidence is a learned skill. Just as you can play a sport better, become more competent at your job or improve test scores, the same is true with confidence.